Acupuncture is the insertion of needles into specific external body locations (acupuncture points) for the purpose of relieving pain, inducing surgical anesthesia, or for a variety of other clinical therapeutic purposes. As a principal technique used in Traditional Chinese Medicine (TCM), the goal of Acupuncture is to develop, maintain or augment physical function by creating homeostasis (balance) in the body through the movement of energy (Qi - pronounced "Chi"). The movement of energy between organ systems occurs through energy channels in the body know as meridians. Insertion of the slender needles goes unnoticed by some. To others it may feel like a small pinch followed by the sensation of tingling, numbness, ache, heaviness or even travelling warmth. Some people feel Qi moving at a distance from the point of insertion. Needles remain in place twenty to forty minutes. Usually relaxation accompanies the treatment. Some notice a relief of symptoms or feel more energetic in the days that follow the treatment. Most people are pleased to find that sessions are not uncomfortable and even look forward to them. A: Most plans do cover Acupuncture, however every health insurance plan is different, so it is important to contact your plan provider to confirm the details of your coverage. Some plans cover 100% of each visit, while others cover a percentage of each visit, and plans differ on what the yearly maximum is and who can perform treatment, so knowing those details will help you manage your care effectively. A: Acupuncture is an effective treatment for many types of pain, including lower back pain, neck pain, headaches, sciatica, foot pain, knee pain, shoulder pain and carpal tunnel syndrome. Many people find relief from their very first treatment, with increased range of motion and decreased discomfort allowing for a return to every day activities. Combined with Chiropractic Care to correct any possible underlying skeletal issues, our team will be with you every step of the way on your path to Wellness. Q: Will the treatment hurt? A: Insertion of the slender needles goes unnoticed by some. To others it may feel like a small pinch followed by the sensation of tingling, numbness, ache, heaviness or even travelling warmth. Most people are pleased to find that sessions are not uncomfortable and even look forward to them. Acupuncture is based on the premise that physical dysfunction and pain arise from imbalances within the soft tissues of the musculoskeletal system of the body. "Balancing Yin and Yang for Optimal Health and Healing"
As we expand our horizons, we are learning to take responsibility for our health and well-being in new and exciting ways. In the wake of this shift in thinking has come a renewed interest in Traditional Chinese Medicine (TCM). This comprehensive philosophy and methodology has been used for over 2,300 years to strengthen the body, restore energy, and prevent illness.TCM encompasses the entire person: physical body, as well as thoughts and emotions. Chinese medical theory incorporates principles of balance and harmony, relating what's known as the "Five Element Theory" and primordial elements (Water, Wood, Fire, Earth, and Metal) with the bodies internal functional systems. As the earth is comprised of soil, water, rain, clouds, and the heavens, the human body is said to consist of Essence, Blood, Moisture, Qi, and Spirit (Shen). Acupuncture is based upon the assumption that Qi exists as "vital energy" and travels through channels in the body just as streams and rivers course across the surface of the earth. Every organ network or functional system has a corresponding set of channels called meridians. Acupuncture points are located in along these meridians, usually at small depressions in the skin where channels come close to the surface. In ancient times, cities were fortified by walls, and gates were opened to receive sustenance and closed to keep away harm. In the same way, with acupuncture, the gates of the body are opened and closed to adjust circulation of Qi through the channels. Thin, sterile, stainless steel acupuncture needles are inserted into points to communicate from the outside to the inside. 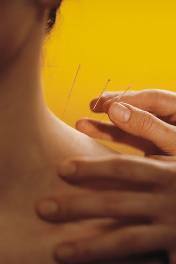 Acupuncture mobilizes Qi and Blood, invigorating proper function of muscles, nerves, organs and endocrine balance.